Praise is our passport into God's presence. My passport has stamps of the various countries that I have traveled. Spain, Mexico, Great Britain. Argentina. In order to enter a country legally you have to have a passport or some type of documentation saying that you can go there. How do we get into God's presence? Thanksgiving is the ticket that gets us to the gate. When you fly to a foreign country, you have to have a ticket that allows you to get on the plane and fly to your destination. When we start thanking God, we take off. When we start recounting all of the things he has done for us our prayers sprout wings. Our altitude and attitude get higher and higher when we think of all of the things that we have to thank God for. Thanksgiving gets us through the gate. But praise takes us to our destination. Praise gets us to the place where we are not just thanking God for what he has done, but we extol, admire and worship him for who he is. We say, "Thank you." We give him thanks. And we praise his name. Jehovah Jireh. My provider. Jehovah Shalom. My peace. My Deliverer. Abba. Father. The Lord God Almighty. The great "I am." Need to get away? 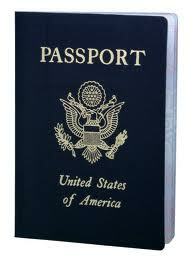 Take your passport and enter into his presence. How has giving thanks to God ushered you into praise and his presence? How do you praise God? Singing? Observing nature? Writing?